I (along with the rest of the world) am in the midst of watching “House of Cards.” While trying not to binge watch and avoid all spoilers, I figured I share my style crush, Claire Underwood, played by Robin Wright. Oh. Mah. Goodness! From her first scene in season 1, I knew I wanted her entire wardrobe. Even her workout clothes feel perfectly tailored! It has everything I love in clothes – clean lines, structured waistlines, a good dose of oxford shirts and just a great tailored style. While Claire wears her clothes as her amour, I see it as a great nod to being classic yet fashion forward. House of Cards has been touted for bringing fashion back to the Capital and for good reason. With designers like Gucci, Prada, L’Wren Scott, and Theory, Claire bridges the gap between the political and the polished. While not all of us have the bank account to support a closet like Claire’s, there are definitely some more mid-range brands that can give you the look similar to the Queen of House of Cards. If you’re looking for clean lines this season, trot down (or click to) Banana Republic’s ‘Sloan Collection.’ This line is particularly great for us curvy gals because all of the Sloan items have stretch in the fabric and sit nicely on our curves. 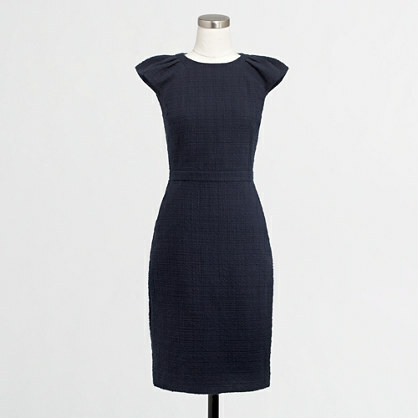 I tried on the Sloan sheath dress and loved it. The short sleeves are conservative with a tastefully done slight sweetheart neckline. It’s going to make it’s way to my closet soon. Pssst – It’s on sale today! Check out other President’s Day sales from Nora’s listing. J. Crew and J. Crew Factory are two other stops worth making in building your classically tailored Claire Underwood-esque closet. Claire makes a blue button down look effortless, especially when paired with a pencil skirt. Another staple for Claire are dresses with a little something extra, like the fluttery cap sleeves in this J.Crew find. The main thing to keep in mind as you are looking for pieces to fit this style – KISS (Keep It Simple and Sleek). Utilize your favorite tailor and keep the pallet neutral. If you add a fierce haircut to it (like my co-blogger), you’ve got the complete style package without the dastardly deeds that come with being Claire Underwood.